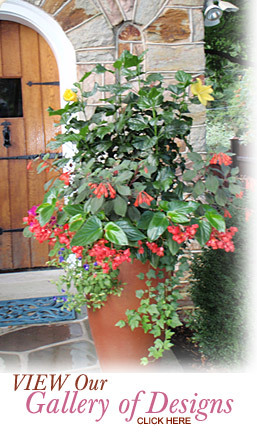 The Gilded Lily truly specializes in the art of Container Gardening. 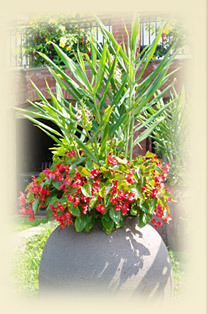 We will custom select the perfect containers for your home and fill them with the most incredible flowers. Whether it's enhancing your front entrance or making your outdoor space more beautiful with lushness and color, The Gilded Lily can make your vision a reality. 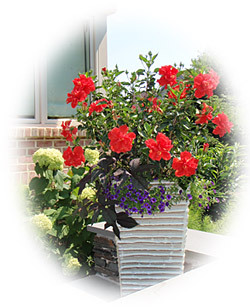 Container Gardening is not just for the Summer months either. At The Gilded Lily we know how to keep your containers looking great all year round! We'll start with colorful Spring plantings in March, add sweet smelling Summer flowers as the months progress, take on the celebration of Fall fruits and harvest colors and then end with a spectacular Christmas or Winter pot display! Enjoy a Vibrant Garden Without all the Work! The Gilded Lily has the talent and dedication necessary to keep your containers in breathtaking quality, all year long. We provide all the maintenance including watering, fertilizing, pruning, and even disease and insect control, so you can spend your time living life and enjoying your containers! Ready to begin your container garden? Contact us today at 575-8567.